John was born in his Grannies house in Tweedmouth 1 May 1933 and soon after moved to the family home in Castlegate. John’s dad was a butcher but serving in Italy during the war, he contracted TB, returned home but died aged 39. His mother died at 45 leaving 3 children, John was the eldest. He left St. Mary’s School, Castlegate at 15 and on the recommendation of the schoolmaster, who was also Chairman of the local Society, went to work as an apprentice joiner at the Tweedside Society. He remembered clearly the interview with the Co-op Committee. It was a Monday night and the following morning he was offered the job- John was their first apprentice joiner. He started work on Monday 3 August 1948 following the Trades Fortnight holidays so he has been in Co-op employment for 67 years. The apprenticeship was seen to be a good opportunity, he enjoyed that kind of was good at woodwork and the workshop was just across the road from his home. His joinery tools were bought for him and cost but he paid this back out of his wages. He was paid the union rate for the job as was the case with Co-op employees. He reluctantly joined the union USDAW and also was expected to be part of the Co-op Pension scheme. (He is grateful for that because as well as his full time salary as Funeral Director he is in receipt of two pensions). Tweedside Co-op Joinery Department did general joinery work for their Co-op premises; shop fitting and repairs as well as joinery in private houses. In those days the local joiner was also the undertaker, making their own coffins- nowadays they are bought in. There were 4 people working there and overtime 3 more apprentices. Two years before his retirement date, the manager, John Crawford, collapsed and died at work and so John Hush was appointed to take his place. John hoped that when he retired, Robert his assistant would take his place. John ran the Co-op Youth Club for many years , the members were in the main young Co-op employees and their friends. He thought it was at its strongest in the 1960’s. The Co-op Hall was used for weddings, parties and dances. Sylvia, working alongside John had originally worked in the office of Tweedside Society. She too has been employed by the Co-op funerals for most of the time John has worked for them. They plan to reduce to part time (12 hours per week) in the summer of 2015 and John spoke very highly of her role in the success of the business. Sylvia’s administrative and personal skills ensured a quality customer service. While other parts of the business suffered as a result of the recent crisis at the Co-op, Berwick Funeral home did not suffer at all. John put that down to the fact that he was a local man and the service he was able to offer could be tailored to the needs of the customer. “I know them and they know me”. We can have a chat (be more informal) and so can more easily establish what kind of service is needed. He is well known in the town and has established a reputation and trust which is invaluable. We specifically talked to John about the role of women in the Funeral business. He could not see that they were treated differently but with hindsight recognised women did not get the same opportunities as men. Mrs Pattison, a qualified embalmer, was his first woman boss of the NE Co-op Society and without hesitation he considered her to be the finest boss he had. John remembers, in earlier days, occasionally going with the food manager on his weekly Monday visit to the Co-op Wholesale in Blandford Street, Newcastle. He was encouraged to say, if asked, that he smoked and would be given a couple of packets of cigarettes. The CWS Monumental Masons were directly across the road from The Blandford Street building. Over the 67 years John has seen lots of changes; the Society merged with Berwick and Spittle, Churnside, Wooller, Coldstream and Eyemouth. Their society had chemists, butchers, groceries, furniture, menswear and ladies clothing departments. The year he started in 1947 they launched the funeral department and over time had 4 workshops in Castlegate. I suppose as it grew the Co-op didn’t have the local contact although Berwick seemed to maintain the local connections. Funerals have also changed, there is less emphasis on religious services and I usually explain that a family member can lead the service with their memories and they don’t have to have a minister. Funerals tend to follow fashions and John said that after a cardboard coffin featured on an episode of Coronation Street sales of these increased. “The job nowadays is very different; we have masses of training and an unbelievable amount of form filling and paper work and there seems to be a lot more people in senior management positions”. 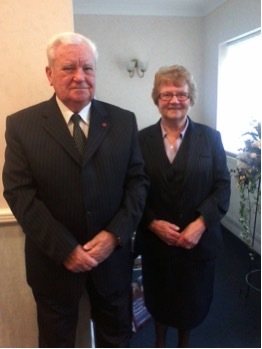 John was the very first recipient of the Co-operative Funerals Lifetime Achievement Award. He had made the trip to the Annual Meeting in New Century House, Manchester with his son but had no idea that the Award was going to be presented- so it was a great surprise. In conclusion John told us that the Co-op was unlike other businesses and he always will see it as something special. Maria and I interviewed John on November 11 and were privileged to be asked to join himself, Sylvia and Robert at their Remembrance Day ceremony in front of the brass plaque which remembered the 8 employees of Tweedside Society who gave their lives in World War 1.